Solomon rectifies that situation in Cities Without Ground, an unorthodox guidebook to Hong Kong he published last year with fellow architects Clara Wong and Adam Frampton. Inside its 128 pages is a brief history of Hong Kong’s “condition of groundlessness,” starting with the dramatic, hilly topography that enabled the growth of a vertical city, followed by the popularity of footbridges as a means to connect buildings on different levels and finally the development of vast above- and below-ground pedestrian networks. Most of the book consists not of text but of vivid illustrations dissecting the warren of subways and skybridges, shopping malls and public plazas that make up many parts of Hong Kong. “There’s an alternative spatial logic in Hong Kong and in order to expose that, we had to reveal something invisible,” says Solomon. “These maps are not meant to be used as wayfinding devices, but I personally find them quite useful as a way of understanding how Hong Kong works.” The maps are as much a document of Hong Kong’s psychogeography as they are of its physical space. Labels include not only the names of buildings and shops, but also human landmarks like “lunching legislators” and the “permanent democracy protest” outside the government headquarters, and “family graduation photoshoots” and a “birdwatching meeting point” in Hong Kong Park. A few months ago, I called Solomon at his new office in Syracuse, New York, where he is the associate dean of the School of Architecture, and we chatted about the book and its reception. What piqued your interest in these so-called “groundless” spaces? 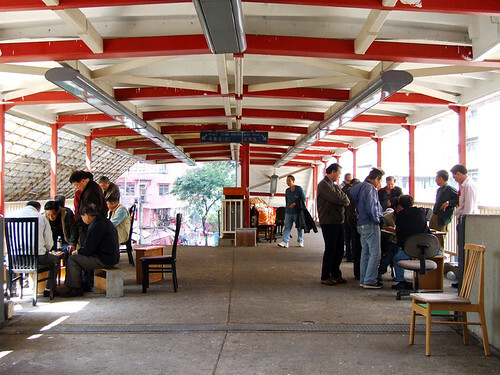 The question is answered simply by Hong Kong — it was this condition of not just publicly-accessible spaces that were deeply non-traditional that intrigued us, but the fact that they functioned as spaces of commerce, protest, recreation that didn’t look like either the traditional Western or Eastern models. They looked like discarded leftover pieces of generic global urbanism yet they are the places where Hong Kong’s urban culture resided. They’re the places where all the people are. The city of Hong Kong is an incredible artefact and one that is world-renowned for its density. It tends to be understood through images of its density. There are popular and academic products of this — the photographs of Michael Wolf and so on. We wanted to expose an alternative spatial logic. Skyscrapers are very uninteresting in Hong Kong, with a few exceptions. They are not nearly as interesting as what goes on at their base, where the people are. In order to expose that alternative spatial logic we had to reveal something invisible. That was the task of the drawings, which was to tease out spaces that couldn’t really be seen as a way of seeing the non-traditional organization of public spaces. Cities Without Ground is a very visual book — there is very little text. Why did you take this approach? There are all these attempts to map Hong Kong but most of them are useless. There’s the Hong Kong Tourism Bureau guidebook which is useless if you’re walking around Hong Kong. There’s all these district council maps that don’t illustrate connectivity — there’s one that depicts the escalator as a line and the IFC as a big pink mass. There are wonderful maps of shopping malls but there is no comprehensive guide to how the shopping malls all connect. There’s no kind of record of all the exciting stuff that happens in these spaces. These maps are not meant to be used as wayfinding devices but personally I find them quite useful as a way of understanding how Hong Kong works. How did the network develop in the first place? Central is really the starting point of the network with the footbridge connecting the Mandarin Oriental Hotel in the 1960s to the prince’s building. That was an example of bottom-up solution-finding — it was a developer who wanted to connect wealthy tourists to a second-level shopping deck. They applied for permission and got it. It wasn’t part of a master plan but it was successful. it created a situation where rents at the second level were higher than rents at the ground level. The goernment saw it, thought it wasn’t a bad solution and decided to do it itself. In the 1980s the [Transport Department] began building pedestrian bridges connecting the ferry terminals to Central. Finally that particular model becomes really institutionalized by the MTR as a strategy in New Towns and in the IFC. In Lam Tin, the transit hub at the bottom of a hill is connected to older residential estates at the top of the hill through two shopping malls. That’s a great example of the collaboration between public and private uses. 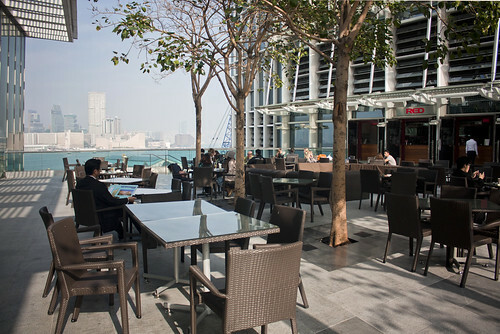 As much as Hong Kong’s groundless spaces are fascinating, do they really make for good urbanism? The book is definitely a love affair with density. To say that it’s totally neutral would be disingenuous. We’re trying to position Hong Kong’s unique three-dimensional density and its presentation of non-traditional public space as an exciting new direction for urbanism. At the same time, I get a range of reactions, some very exciting reactions and some highly suspicious reactions. The question I usually get asked at least once when I present it is, are these good spaces? They are usually from people who subscribe to a very traditional view of urbanism. The point is, who are we to say what is good space? Yes, spaces that are quiet and clean and have trees are good spaces, but spaces that have people are good, spaces that are convenient are good. We can’t take an American notion or Dutch notion of good spaces and apply it to Hong Kong. It’s not productive to do that. There are definitely good footbridges and bad footbridges. Some are in the right place and some are in the wrong place. But I try to avoid conversations about whether Hong Kong has good space or bad space. 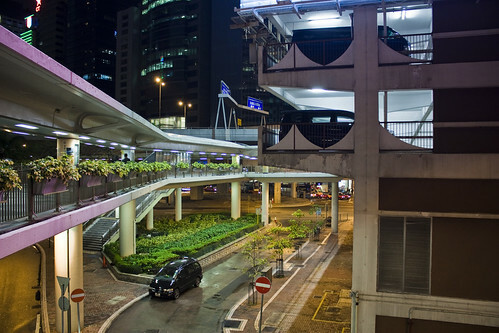 [Hong Kong district councillor and urban design activist] Paul Zimmerman and I disagree vehemently about this — his position is that all the footbridges are more or less bad and that Hong Kong should act more like a Dutch city. In some ways I agree. We need to make safer, healthier streets for pedestrians. Pedestrianizing Queen’s Road makes a lot of sense. But there’s a lot of wishful thinking involved thinking that Hong Kong will suddenly turn into Linden or Delft. In most cities there’s a very clear distinction between public and private spaces and each has its own set of assumptions about what people can and can’t do. What’s happening in Hong Kong? In Hong Kong it really is the act of using the space that makes it public. The ownership of the space is not particularly relevant. There are spaces that are publicly-owned that are not used. The maintenance space does not make a difference because there are many publicly-owned spaces that are maintained privately. The weather doesn’t seem to matter. It’s the exertion of their rights to use the space that makes it a space to be used. When a commuter walks through the IFC Mall to get from the ferry to the bus, they’re using it as a public thoroughfare. When foreign domestic workers sit on a footbridge, it’s public space. When Occupy Hong Kong protesters squat under the HSBC building, it becomes public space. It’s the ability of the public to subvert all of those other barriers to public use that really make the space what it is. That’s ultimately what is so special and what gives the city so much potential. Because those lines are so clearly drawn elsewhere they don’t tend to move around a lot. There are “good” streets and “bad” streets in every city — streets that are genteel, others that are tatty and run down. How does this manifest itself in Hong Kong’s 3D spaces? We talk a lot in the book about hierarchy. In a normal city where there is a ground, you have solid objects and voids that help you know what kind of space is what. Streets have an axis and if you look down the street there is something important; parks have an edge, cities have a centre. Really important buildings stand out. You can see their shape. The whole history of urban form is about the relationship of the object to other objects. In Hong Kong, because there’s no ground, there’s nothing to position a figure on. You get these continual figure to figure relationships where buildings are so tightly mashed together you can’t visually perceive anything. So you have this hierarchy based on other senses. You know when you are in a high-end shopping mall when the air is cool and dry and perfumed. Yhen you realize you’re in a transit space when things get a little bit warmer and noisier and the materials are a little less reflective. Admiralty is a great example. Think about other major world cities, the relationship between the city’s major formal part and the city’s seat of government — and now think about the relationship between Hong Kong and the legislative council headquarters. there’s no axis, no edge, no centre. 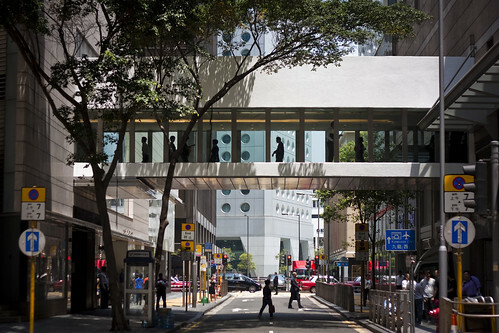 There’s a tortuous line — you go down an escalator to Pacific Place, down another escalator, over a footbridge, and you weave through a number of small spaces. You’re constantly moving up and down and side to side, from large spaces to small spaces, from high end shops to low end shops. and yet it still works. people still move through it and use it. People know where things are. It’s proof of the fact that all of these formal conventions can be rethought. It’s a very strong rejoinder to conservative forces in the architectural discipline who argue that form still matters. Is this something that is being adopted elsewhere? Hong Kong’s density is definitely unique and most cities aren’t going near that anytime soon. But the model of dense, integrated, multiuse urbanism is increasingly the norm in an Asian city and it’s becoming more popular in American cities. I’m working on an exhibition now that will open in New York at the AIA that will look at the work of American architects in Asia over the past 15 years with a focus on these kinds of developments, and then looks at similar sites in New York being developed by the same architects that employ similar techniques, like the west side railyard, the Hudson Yards — KPF is working on it and they’ve been doing buildings in Asia for over a decade. So this model is moving around. It also has some american origins. Rockefeller Center is a great prehistoric version of a lot of this stuff in terms of its integration of transit, above and below ground movement, multiple programs, multiple scales. Bangkok is also interesting but it’s very specific because of the history, the development of shopping malls along the rail line, the megablock type of urbanism particular to Bangkok. In part it’s because it’s Hong Kong developers who are building these things [in other cities]. Just like all these skyscrapers in Vancouver because there’s a huge Asian influx — you have Hong Kong developers going into China or other parts of Asia and they work on models that they know to be successful. I definitely think that model will continue to proliferate. How can architects and planners work within a condition of groundlessness? The first rule for planners is to start thinking three-dimensionally. The outline zoning plans in Hong Kong are really old-fashioned. They are plan-based, not set up to deal with the reality of Hong Kong urbanism. I think that planners need to have a better sense of what this network is and where it works and where it doesn’t so they can make better choices about how to expand it. 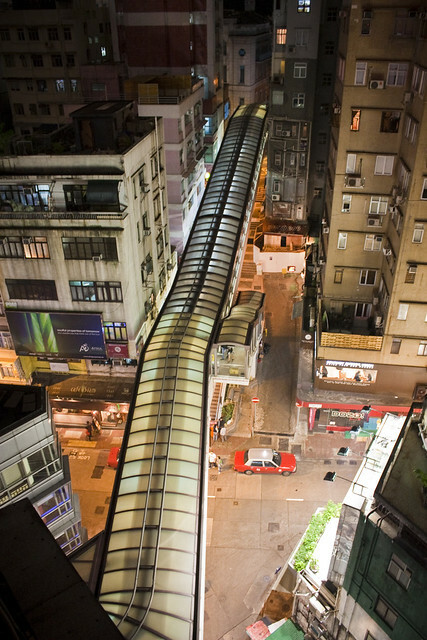 The escalators on the west side of Hong Kong Island are a great example of this — do we really think an escalator on Pound Lane makes sense? No, it doesn’t, but you need to understand this model of public space to know why it doesn’t. 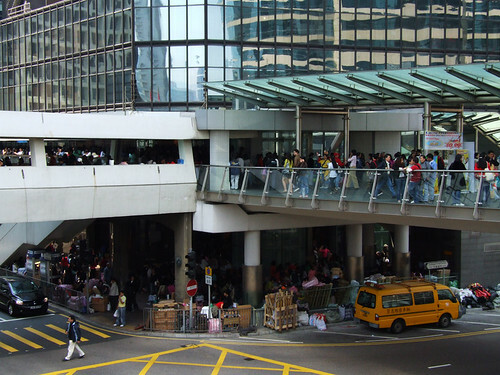 And do we really think the solution to TST’s problems is more footbridges? Probably not. But in order to know that you have to understand the network. This entry was written by Christopher DeWolf , posted on Friday August 30 2013at 08:08 pm , filed under Architecture, Asia Pacific, Books, History, Interior Space, Maps, Public Space, Society and Culture, Transportation and tagged 3D Cities, 3D City, Cities Without Ground, Footbridges, Hong Kong, Pedestrians . Bookmark the permalink . Post a comment below or leave a trackback: Trackback URL.